It’s midnight and I’m just back from dinner. It was a lovely night out on the Black Isle. No light pollution out there so there were a gazillion stars. Plus there’s always an assortment of dogs around at the brewery. Tonight I counted three Jack Russells, two spaniels (one of whom was excellently named Daniel) and a pointer. I so miss having a dog – I spend way too much time sighing over the Australian Working Dog Rescue Facebook page – but for now I get my fix patting the brewery hounds, without all the faff and hairs of owning one myself. In case you’ve never had reason to stare at a map of Britain, I must tell you that the Black Isle is not actually an island. It is a peninsula. A mere appendage. When my Aussie friend Jason discovered this he said, “Scotland… built on lies!”. At the start of the year I made a pact with my friend Jennette to write a blog post every week for eight weeks, OR ELSE. If one fails to write a post, the other scores $5! We used Stickk to make it formal. I’m chuffed to have made writing a habit again, with huge credit to Jennette for spurring me on. I’m not worrying about quality right now; 2014 is the year of Project Consistency (but apologies to you). I made it all the way to the eighth week… before wilting tonight, at the final hurdle! Here I am at 12.30AM feeling delirious and cursing my slackarsery. I went through a period in primary school when I would constantly whinge to the teacher, “I’ve got nothing to write about”. It’s actually there on my Year 4 (4th Grade) report card, something along the lines of, Shauna needs to stop whinging that she has nothing to write about and get on with her writing. Then I went through a prolific phase when I could not stop writing. There were such gems as The Very Hungry Shark. It was all about a very hungry shark. It kept following a fishing boat everywhere and the sailors were getting worried. But the captain knew the problem was simply that the shark was very hungry. He came up with the solution of throwing the crew’s breakfast scraps overboard each morning for the shark to eat. Apparently this shark thrived on egg shells and bacon rinds. THE END. In other news, the exercise portion of Project Consistency has been pretty good. 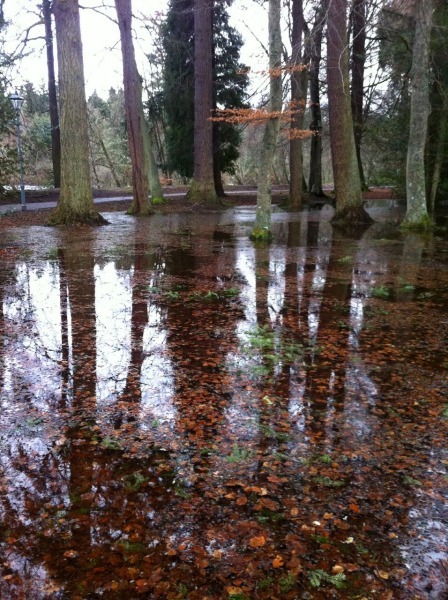 On a recent morning walk the Ness Islands were flooded after mega overnight rain. It was lovely clear water and I saw three herons. THE END. Scone update: We went back! It was quiet this time, and the scones were still warm from the oven. And delicious. And the size of a toddler. Up & Moving – a new course for beginners + giveaway! Boy, I’m thinking Jaws could have been a lot different had they but known. I hadn’t noticed what days you were posting but I had noticed an increase in the number of posts. I think it’s good discipline to write frequently. Plus, as I know to my cost, the more you write the less you worry about quality…not that I have ever read anything by you that wasn’t quality. Wow, nice one, Kathy! Phew. 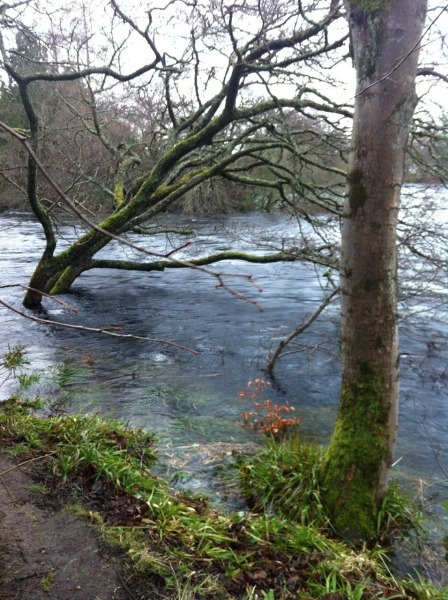 thats a lot of water. I suddenly had the same thought as Carla: I need to stop moaning about how horrible it was to wade through a flooded parking lot this weekend and remember that we have ~360 days of sunshine here. Also, I want that scone. I could probably only have a few bites with some good, strong coffee and be full, but I want to eat every crumb! I love your writing and I’m so glad you’re back consistently! I’m in America (the deep southeast) so I love seeing the pics you post. I’ve never been on that side of the pond, but I’d love to go and your pictures pique my interest every time. Keep up the excellent work! 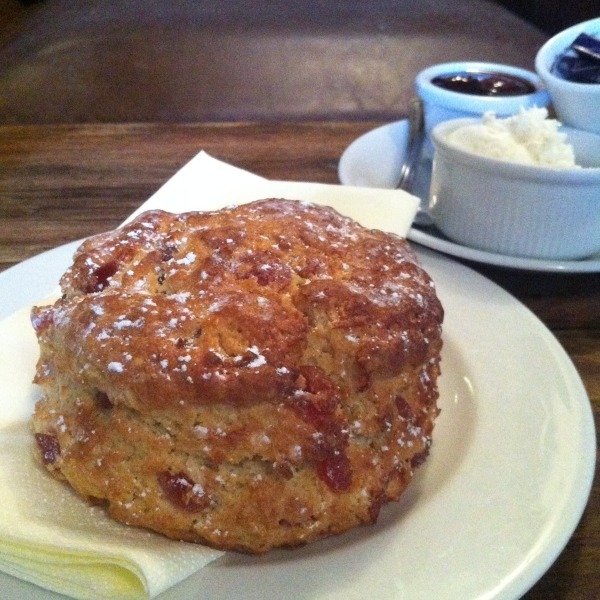 BTW…that is one awesome, delicious looking scone! Dude. I want to eat that scone. With cream and jam. Right about now! That is one epic scone. Here in America we would call that a cat head biscuit. I hope it was as delicious as it looks! Just want to let you know I love reading your posts, they always make my day! That scone pretty much was the size of a cat head, now that I think of it. Hehe! I’m delighted as well, you’re really a gifted writer and your posts always make me smile.